Many people in the Las Vegas community stepped up to help a family who is struggling to deal with their child's rare medical condition. They have received donations and other offers of help. 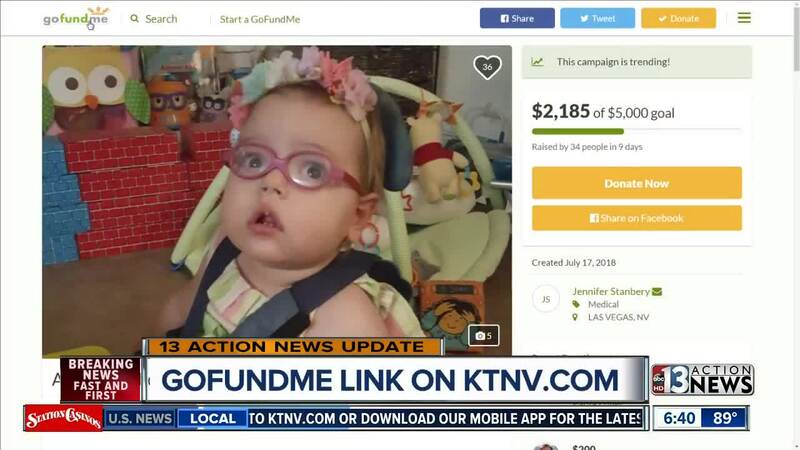 UPDATE JULY 27: Many people in the Las Vegas community stepped up to help a family who is struggling to deal with their child's rare medical condition. They have received donations and other offers of help. 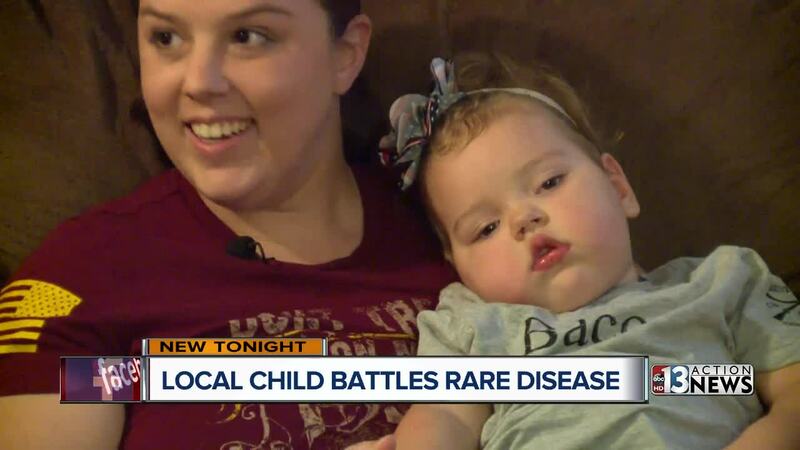 LAS VEGAS (KTNV) -- A Las Vegas family's child suffers from a rare and debilitating disease that forces them to spend many nights in hotel rooms away from home, traveling long distances to get her the care that she needs. Audie Stanbery is 22 months old. She has a genetic mutation that causes seizures and severe developmental delays. When we met Audie Wednesday night, she was having a bad day. And a bad day for Audie often means lots of seizures. And also infantile spasms. "Her whole body tightens up," her mother Jennifer said. "She had about six of those within three hours." Audie was diagnosed with cdkl5 shortly after she was born. It's a rare genetic disorder best described as a severe form of epilepsy that causes frequent seizures and developmental delays. "Every day she gets worse," said Jennifer. "More and more seizures every day. She cries more and more every single day." Audie is nonverbal. She's fed through a tube. Her tiny bed sits in the living room so that her mother can sleep near her on the couch and doesn't have to move all of her medical equipment back and forth between rooms. Keeping her comfortable requires as many as nine medications a day all costing hundreds of dollars a week. But those medicines are becoming increasingly less effective. The Stanberys see promise in a treatment being offered by a specialist at a Salt Lake Children's Hospital. "We are watching our child suffer ever day and there is nothing we can really do," Jennifer said. With friends they have started a GoFundMe page hoping to raise the $5,000 dollars to cover expenses for the trip and making it possible for Audie's dad to miss some work. The couple, both Army veterans, were reluctant to ask for help. "We hear of children and people dying of seizure and epilepsy every day, and we just feel the more we are sitting at home the more at risk she is for that." Like most parents they are willing to set aside pride just to see their child healthy and happy. Audie was named after Audie Murphy , a World War II hero who was almost awarded every medal given for combat.